Public Cloud is here to stay. Cloud Revenue Projection in 2020 for Amazon AWS is $44B, Microsoft Azure $19B and Google Cloud Platform $17B. Haters gonna hate and smart enterprises are already adopting cloud to cut costs and time to market. Lift & shift – exactly what it sounds like, the approach is migrating applications to the cloud without any code changes. While it’s the least time intensive, it lacks cost benefits by not taking advantage of dynamic cloud capabilities. Refactoring – involves rearchitecting/recoding applications to take advantage of cloud-native frameworks. This approach is the most time-consuming and resource-intensive, but it can offer the lowest cloud spend. Replatforming – provides the middle ground between rehosting & refactoring by making few code/version changes using less engineering resources. All 3 options need engineering investment but they also require a key ingredient: cloud-native expertise. If a company has an existing DevOps culture, their team is already equipped to go down either one of the above paths. But what if they don’t? They will need to invest heavily in initiatives to recruit a cloud engineering team like CapitalOne. That means both time and money are at stake. So what’s the alternative? 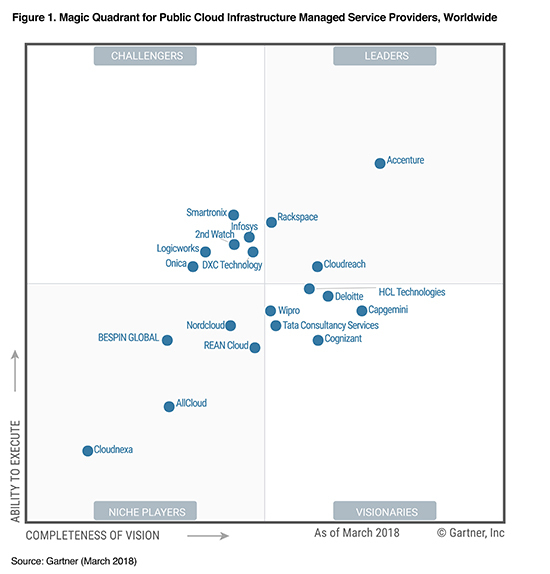 “Born in the Cloud” managed services providers (MSP’s). AWS alone has 100+ managed services partners. So what does a typical “born in the cloud” Managed Service Provider (MSP) do? They’re a more sophisticated version of a traditional hosting provider. Majority of their business is to manage a company’s application and infrastructure with agreed upon SLA’s. Most of these MSP’s also provide migration services to companies as a strategy to eventually land them as a managed services client. They offer teams with strong cloud-native skills and expertise in migrating customers towards DevOps and automation. 1) Cloud expertise – Most of these firms are founded by cloud and DevOps experts that have helped organizations migrate to the cloud. This makes them a great acquisition and acqui-hire target. 2) Cost – Given that MSP’s manage several clients’ infrastructure, they are able to leverage economies of scale and get favorable terms from their cloud and SaaS partners. P&L/Offerings Leader: This person is the “CEO” of the MSP practice and responsible for P&L. They usually have the last say on tools and offerings. Technical Leader: This is the right hand of the offerings leader. They vet new technologies that can help them deliver a better customer experience. Delivery: This person’s team is usually responsible for on-boarding & managing the client environments. Flat monthly fee: This is a subscription that an organization will purchase to have the MSP manage their infrastructure. % of cloud spend: This is mostly used by the large MSPs as they want to follow the pay as you go model offered by the cloud providers like AWS. While both of these models are very customer friendly, there’s a risk around predictability. Several MSP’s including large ones like Rackspace are pushing “no commitment” pricing which can throw the business for a toss if a large customer churns. On the flip side, there are aggressive discounts offered for long-term contracts which makes large enterprises chose the latter. Typical managed services gross margins (50-60%) higher than professional services (40-50%) and resale services (10-20%). In addition, cloud providers and ISVs offer aggressive incentives to MSP partners push their products which can add to the margin. Legacy Service Integrators/Outsourcers like Wipro, TCS, HCL etc. are forced by the market and modern MSP’s to start a cloud practice. They don’t have cloud-native DNA and are slow to move given the sheer size of their organizations. That said, they have deep pockets and ties with large enterprises giving them an easier “in” while selling cloud services. Organization can also decide to run their own applications and infrastructure for several reasons like in-house expertise, regulations and higher control. Gartner is projecting that the overall 2019 global IT spending is $3.7 trillion. Specifically, IT services spending is projected to surpass $1 trillion in 2019. A quarter of this could be attributed to cloud and managed services, making the TAM approximately $250B. Need help on which MSP’s to invest in? Email me on my firstname@firstnamelastname.com or tweet @thesmitpatel — I’d love to help.